Rob Arcand is a writer, editor, and web designer. His work focuses on the relationship between digital platforms and the arts, and he’s published pieces with SPIN, Pitchfork, Vice, The Outline, and more. He’s also currently a graduate student at Duke University, where he writes about the political economy of digital media. 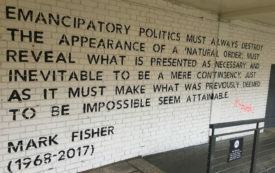 Through his blog, k-punk, Mark Fisher pioneered a different kind of cultural criticism.